There is nothing more valuable than your time. In this introductory phase 2 lesson, Matt reviews some basic practicing exercises so that you can get the most out of your practice time. Chapter 1: (06:03) Introduction and Hammer-ons Matt introduces the idea of creating a practice schedule. By breaking down guitar playing into its basic technical components, the guitarist is able to focus on specific weaknesses. A practice schedule should be developed to ensure that each technical aspect of guitar playing is addressed adequately within a week period. In this scene, Matt demonstrates several of his favorite warm-up exercises. This exercise is designed to enhance the tone, rhythm, speed, and accuracy of hammer-ons. It's a really easy exercise to learn, but it really improves your left hand. This exercise is a must if you want to work on strengthening your pinkie finger. Chapter 2: (13:43) Additional Exercises with Right Hand Techniques Matt shows some exercises that isolate the right hand. He also introduces other technical concepts that require maximum attention. These are: Scales (major, minor, diminished, augmented, all modes, blues scales, pentatonics, etc. ), arpeggios, and right / left hand synchronization. Kirk Hammett's Excellent Right Hand Exercise. Taking the left hand out of the picture allows you to really focus on your picking. Right hand speed is contingent upon two factors: economy of motion and speed. The first of these is the most important. Right hand speed is created through repetitious accuracy rather than simply moving your hand quickly. The first exercise focuses on these right hand mechanics. It is primarily designed to develop right hand speed, accuracy, and palm muting. This exercise focuses on the same skills involved in Exercise 1. It is very important to vary which exercises you practice. This is an exercise physiology concept that ensures maximum muscle development. The muscles in our body have memory. By performing tasks that they are less used to, they receive more benefit. Exercise 3 is straight from Villa Lobos' Etude No. 1. It works your ability to play arpeggiated passages in which your right is required to skip one or more adjacent strings. Right/Left Hand Synchronization AKA THE MOST IMPORTANT EXERCISE EVER! Playing cleanly (not with notes that accidentally are muted) requires careful planned timing between both hands. The left hand must fret the note before the right hand picks it. Eliminating wasteful movement enhances the accuracy of both hands. Matt explains "good classical left hand technique" alongside this exercise. Chapter 3: (05:06) Bending and Tremolo Picking Matt explains the do's and dont's of bending and tremolo picking. Make sure you practice bends of varying intervals. Make sure all bends are in tune. Don't hurt yourself! Don't bend strings that are bigger than what you are comfortable with. Pull your pick closer to your palm with your thumb and first finger to create a sharper angle between the pick and the string. Rest your right hand on the bridge. Chapter 4: (04:46) Left Hand Speed and Trills Matt explains the basic mechanics of the left hand and how they apply to guitar technique. The music theory behind playing arpeggios is also explained. Designed specifically to develop left hand speed by strengthening both the extensor and reflexor muscles in each left hand finger. Cool, been looking for a video on this site explaining an exercise program. Thanks. Your 1st lesson is straightforward and motivational, Matt. Thanks a lot. I'm into Rock and your lesson series is great to me. Thanks a lot! I'm glad you like them! Let me know if you ever have any questions. ;) Take care! Great lesson Matt I really appreciate your lesson. Hi! Sorry! You're right, that appears to be missing from the supplemental content. String skipping technique is covered in the second scene from 6:30 - 7:30. I'll make sure the tabs / notation get added. :)Also, I think a later lesson covers this entire piece of music in detail...lesson 30 I think. Thanks.... Lesson 30? That's a long long way away! I'm already struggling! But this lesson is great. Thanks again. Hi, Can anyone please explain how a metronome is set when playing 16th note triplets? Hi! At first, I like to practice with the metronome set to click on the eighth note. So, if you're playing 16th note triplets, there will be 3 even notes per click. Then, once I'm playing the idea perfectly smooth and in time, I set the metronome to click on the quarter note (6 even notes per click). Thanks for your quick response. It all makes sense now. I've just bought a new korg metronome and intend to get my poor rhythm skills up to speed. with the exception of the second scene, all scenes don't load. it appear written "video not found http://media-ecl...." Is it my problem or is it happening to everyone? Hi! I just tried watching the first scene, and it worked just fine for me. Try emptying your browser's cache (under the drop down for the name of the browser). Then, close your browser, re-open it and try again. If that doesn't work, please contact [email protected] Thanks! It's working now, chinese internet connection is just kind of crazy but now everything is fine. Wow.I didn't realize how difficult it was to get my pinky to stay close to the strings. Like you commented, it tends to do that "British tea" thing and it's a hard habit to break. It sure is! Try not to drive yourself nuts when trying to keep your fingers close to the fretboard. Just work on it for a little bit each day. It probably took me a few years to train my fingers not to have minds of their own. Also, keep in mind that this is an area that you can always continue to improve upon. No matter how economical your movements become, there's always room for improvement. when will you start live lessons again? Hi, Matt: For playing-while-standing, what do you recommend for the height and angle of the guitar? Thank you! I adjust my strap pretty much the exact same way regardless of whether I'm sitting or standing. The strap should be adjusted such that your left bicep is exerting the least amount of energy to hold your left arm up. For most people, the neck will form a 45 degree angle with the ground. The body of the guitar will most likely rest against your abdomen rather than your right leg. Once you have your strap adjusted like this, just stand up! Then, make any necessary minor adjustments. I bring my strap down just a little since I have relatively long legs and a shorter torso. matt, why not rest your hand on the bridge? When you're playing string skipping stuff, anchoring your wrist limits its range of movement since its fixed to a certain location. It's just way easier to skip from the sixth string to the first string quickly when your wrist isn't locked in one spot. Lots of great stuff that is saving me wasted time and energy. Thanks Matt! Glad to hear it! That's what I was hoping for! Regarding the hammer-on exercise. Do I need to use alternate picking or just downstrokes. Maybe not a very clever question but I just want to get things right. I usually do it with just downstrokes...I like to keep things simple when possible. i vote for 3-1-2-4 as the hardest of the synchronization excercise. yep...that one is definitely a tough one. Matt, i have a question regarding the Kirk Hammet low E string sixteenth note and sixteenth note triplet exercises. Should i increase speed within the 3 minutes or stay at the same tempo for 3 minutes and increase for the next 3, etc?. Within the 3 minutes, keep the metronome at the same tempo. Then, if you can, increase the tempo the next time you repeat the exercise. All great exercises. I've just one question that doesn't seemed to be covered anywhere. How do you work these exercises while standing up? I'm guessing most guitar players actually stand up during performances and the techniques must be different from sitting down, which I noticed myself. Like how far up do you strap your guitar? Do you have it lower or higher while standing or? Matt, I have developed what I consider a pretty good practice routine using a combination of your practice drills and the drills Dennis Hodge presents in the Metal Section. The improvement has been awesome. Despite my progress, I struggle to play the 16th note repetitive riff at the beginning of Slayer's Raining Blood. It is a simple pattern of 5-3-2-0, 6-4-3-0 played on the low E. The tab shows part at a mind numbing 218 BPM. I struggle to play this clean at 96 BPM. The problem is the left hand just cannot keep up. Is there a technique or trick to playing this fast, or is it simply practice, practice, practice? Hey! First and foremost, your entire body has to be as relaxed as possible to play all of that crazy fast thrash stuff. Second, developing speed is like training for a sport. You consistently have to practice almost every single day, or you will lose endurance and speed. Another thing to consider is that the Slayer guys are some of the fastest players on the planet. I learned Rain in Blood as a teenager. I think I had been playing for about 7 years at the time. I got pretty close to the recorded tempo, but not quite all the way there. So, it's going to take some serious time and practice before you can pull a song like this off. I recommend you start practicing the song in its entirety. Start at around 85 beats per minute and make sure that you can play the song start to finish with absolutely no mistakes. Then, go up to 86 and repeat the process. It will take you at least several months if not years to get to the recorded tempo, but if you hang with it, I guarantee you'll get there. Hi Matt: Regarding the hammer-on drill ... You show examples using the index & middle fingers and middle & ring fingers. No drill involving the index & ring fingers? Hey! Good question. You're right...this particular exercise doesn't give you any practice playing a hammer-on between fingers 1 and 3 or fingers 2 and 4. You could easily include these combinations though. For example, hammer-on from the first fret to the third fret with either of these finger combinations. Then, just continue the pattern like I demonstrated in the lesson. Matt, I am not clear on how to count the 16th note triplets or how to pick them? Should it be down-up-down, down-up-down? BTW - Could not believe how hard the 16th note down picking "only" was. I expected it to be easy, but the repetitive motion got to me about 2 mintes in. Great lesson and just what I needed to improve technique. Great! I'm glad that you're improving! I originally learned these from an interview / lesson with Kirk Hammett. He mentioned that these are some of the right hand exercises that have helped his speed and endurance the most. As far as the picking pattern for sixteenth note triplets (sextuplets) is concerned, the pattern is down-up-down-up-down-up. It's just alternate picking. Ok, so straight 16th notes are 16 notes per measure and counted: 1-e-&-a, 2-e-&-a, 3-e-&-a, 4-e-&-a. 16th note triplets are 24 notes per measure and counted: 1-trip-let-&-trip-let, 2-trip-let-&-trip-let, 3-trip-let-&-trip-let, 4-trip-let-&-trip-let. Is this correct? Yep! Sounds like you understand this. There are a few different ways to count sixteenth notes and sextuplets out loud. The two ways that you listed will definitely work though. the hammer on exercise sounds like something from mario bros.
Ha! I never noticed! It does kind of remind me of the music they play in the underground type levels. I kind of went backwards... I learned my first song then I went into Chromatic scales and such. It helps A LOT to practice scales and other finger exercises before learning a song. Especially if the song has a solo... -_- Thanks for the variable exercises Matt, I'll use them every day. Hey! I'm glad that you're finding these exercises useful! I learned most of these exercises over 10 years ago, and I still practice them on a daily basis. There's always room for improvement! I was surprised how much it worked my ring and pinky fingers. If then cant strengthen them nothing will it sees... Whew tire fingers. Yeah...These exercises are great. Make sure that you don't over do it though. Pain does not equal gain when it comes to improving your guitar skills. Yea my schedule is booked with dungeons and dragons. Such a GREAT lesson!! Thanks so much! Glad you found this helpful! Good luck! I can't find the right hand string skipping exercise, the one "straight from Villa Lobos' Etude No 1" as said in the lesson information. Hey! If you check out jazz lesson 9, there is a complete transcription of that piece under the Supplemental Content area. The Trill Exercise in the supplemental content shows a broken link. Help please. Great lesson. Is it wrong to use my pinky as an anchor with my right hand? I noticed you dont in any of the exercises. Is there any loss in accuracy, speed, consistency or range of the motion? Plus, for fast picking, should the picking motion come from the wrist or the fingers? From what I understand (from hearing 2 dozen different teachers give their input on the topic), this is a matter of personal preference. It is 'proper' not to use it (provides more mobility / fluid motions) but a lot of people advise using it. I've also seen a ton of great guitarists (famous guys/gal) use it as an anchor. The Hammeron exercise is hard. Yeah, that is a tough one. Just keep in mind that every new skill is hard at first. Work at it slowly, and you'll get it. Hi Matt I can't see the trill exercise in the supplemental content. Could you help me? Excellent lesson Matt! I'm looking forward to continuing this series. Great lesson Matt. Like iserious, I wanted to play songs, went straight to phase three and realized I was being a little unrealistic. I found this lesson and will try to do a little each day. Already I can see how it will benefit and your comment about doing these exercises first makes a lot of sense as I have the attention span of a goldfish/ low boredom threshold, and if I start playing songs, I never go back to do exercises. The pinky problem made me laugh as mine still sticks up about an inch off the fretboard and it drives me nuts! I'm so glad to know this is a common problem for beginners. I have already learnt more from the few of your lessons I've done than I did in the year I spent with my old instructor. Your awesome! yo mat how long did it take you to get it sounding good? 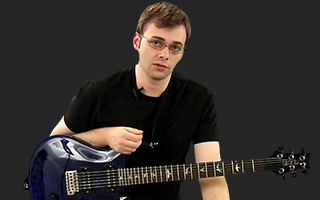 Yeah, and all these good technique exercises made me late for my fencing class, the chess club demoted me, and my D&D clan won't even talk to me now that they know I'm learning guitar -- j/k, great lesson Matt, your dry humor keeps my attention! I bet your D&D clan secretly wishes that they could play guitar too though. Thanks for the feedback! Lets get visuals of all those different scales in the Teaching Tools section; that would be great! It's a work in progress. We're working on a "scale library" for you guys. The finger exercises are fantastic, like anything else you must practice practice practice. I do right hand exercises while the commercials are on during football. At age 49 I have alot going on so I try to utilize time when I can. Thanks Matt. Matt - When I first started here just over a week ago I casually through some of the site content and was particularly interested in the songs section (3). Being a complete novice I'm sure you can imagine what it was like trying the Stairway to Heaven lesson. I was sorely disappointed - thinking you were going much too fast and barely lifting your fingers off the fret board made it difficult to see exactly what you were doing. Same is true of the scales lesson. Now for the irony - I've since gone through things a bit more methodically I've come to understand the *reasons* for all these "mistakes". Having listened to some of your lessons repeatedly it started making sense! Above all, I must say that THIS LESSON bought it all together. I know understand that you're SUPPOSED to keep your fingers close to the fret board and that the reason you're so agile is precisely because of exercises such as those taught in this lesson. I've tried it with marked improvements in less then an hour! Matt - You've since become my favorite instructor! Thanks & keep up the great work! Glad to hear it! Keep up the good work! Thanks for the answer, all hope is not lost then ! And after 2 weeks of exercices, I already feel I gained a lot of dexterity and coordination - learning songs is just that much faster now. Matt is absolutely right! When I first started my pinky was all over the place except where I wanted it. Now I use it more than my third finger. I can't use my third finger for "A" shaped barre chords cuz it won't bend back at the first knuckle but my pinky works great for the barre! It did take at least a couple of years to feel comfortable and in control of it though!! Keep on rockin' it'll happen! This is a very common problem amongst guitarists. It took me three years of diligent practice before I felt like my pinky and brain were totally synced up. Keep working on the excercise, but don't drive yourself crazy. Work at it a little bit each day. Like I said, it will take you a few years. Just keep doing what you are doing! Hey there. I have been trying to get a pratice routine worked up (thanks for the exercice ideas, they really help). There is just one thing that is still a problem when practicing. When i do chromatic like / scales exercices, my fingers stay pretty close to the fretboard, but sometime and for no reason my pinky comes up. And when I do the hammer on exercice between my fingers 2/3 and 3/4, sometimes my first finger straigtens up. Do you have an advice to keep those down, or should I just keep practicing harder ? It really feels like they get disconnected from my brain, and beside the "hoh sh*t loosing control of my fingers" unpleasant feeling, I can't seem to find a way to train those to stay down.